In 2019, PC gaming will be as strong as ever. There are several reasons for this, and one of them is the popularity of massively multiplayer online (MMO) games, which have always had a special connection with this platform. World of Warcraft has been a hugely popular example of this ever since its launch, you have MOBA (multiplayer online battle arena) games like League of Legends with many professional teams and lucrative tournaments, and countless others. Because of their popularity and competitiveness, you need every advantage you can get when playing these games. 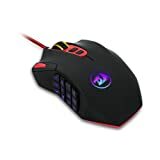 Therefore, we are here to help you pick the best MMO gaming mouse 2019 will be a good year for MMOs and these accessories will allow you to make the most of it. UtechSmart may not be a company as well known as the makers of the other two mice on our list, but that should not deter you from giving their product some serious consideration. The Venus is a very nice peripheral, specifically designed for use with MMOs, and simply ticks all the right boxes. Whenever you read about high-end gaming mice, one of the first things people tend to talk about is the DPI. This stands for “dots per inch” and it shows how sensitive the mouse will be. Because DPI is a true buzzword in this field, it represents a good place to start our review. The higher this number, the higher the sensitivity. So, when you have a mouse with a high DPI, the cursor on your screen will move farther when you move the mouse. This also means the peripheral will be able to detect subtler movements. You will often see manufacturers boast about this figure with their mice, and the Venus comes with a maximum DPI of 16,400 – a very respectable number. But bigger doesn’t automatically equate to better, and what you really want is adaptability. Different game circumstances will call for different levels of sensitivity, and you want to be able to switch between various settings on the fly. Naturally, the Venus gives you this option with five DPI settings you can easily cycle through using two buttons along the center of the mouse. And while the DPI is always important, another feature is probably even more relevant when it specifically comes to MMOs – the number of buttons. For high-level MMO play, the standard setup simply will not do. You need additional buttons and the ability to assign shortcuts and macros (input sequences) to them. The Venus gives you 18 buttons you can program (19 in total), 12 of which are on the side and accessed using your thumb (this is a defining feature of MMO mice, and we’ll discuss it further in the next review). The Venus also has the ability to save up to five profiles (for different users or if you want to have custom settings for different games) and comes with a customizable weight set, allowing you to make it lighter or heavier to suit your taste. Of course, there is always some room for improvement. For one, it is not the most comfortable mouse out there. It is far from uncomfortable to use but for example, the thumb rest isn’t ideal. Also, the left click may be a bit too sensitive. 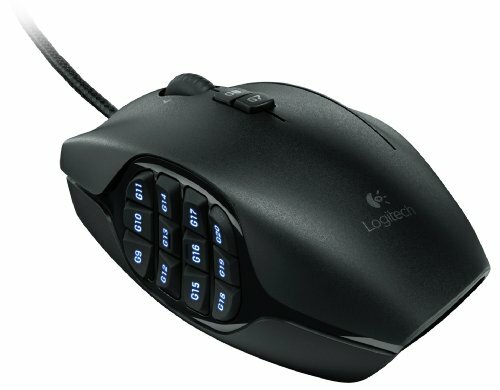 While Logitech isn’t a company which primarily markets its products to gamers (unlike the following brand on our list), it still produces some excellent peripherals for this purpose. The G600 is a prime example of this, and the mouse is very well-regarded among MMO players. When we talked about the Venus, we said that the additional buttons were extremely important for MMOs. This is due to the nature of those games, and your characters will have very contextual abilities. You won’t need them all the time, but when you do, accessing them as quickly as possible can give you that slight edge needed to come out on top. All three mice on our list are excellent in this department, but the G600 stands a bit above the competition in our opinion. It has 20 buttons, the most on the list (although not by much). This gives you amazing potential for customization. The thumb panel (once again containing 12 buttons) has a unique design – it can help you navigate those buttons more quickly but does require some getting used to. The DPI is 8,200. It’s the smallest on our list, but that isn’t much of an issue here – for MMOs, that is more than enough. Of course, you can quickly shift between different levels (up to five per profile). It is also very sturdy and has a nice weighty feel. Although, some may think it’s a bit bulky, and you do need to grip it in a pretty specific way in order to comfortably access all of the side buttons. 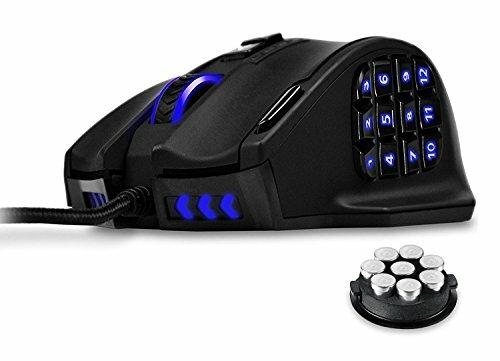 But all in all, the G600 is a solid contender for the title of the best MMO gaming mouse 2019 has to offer. As mentioned, Redragon is a company which primarily caters to the gaming population. Their products have a distinct look and perform well, making them quite popular. That is precisely why the M901 is on our list. You’ve noticed that the previous two mice featured rather similar characteristics, and this one will be no different. That is simply what’s come to be expected from MMO mice, and all these products deliver. Once again, this mouse features the 12-button thumb panel. There are 6 more buttons the user can program and 19 in total. One area where the M901 really stands out is the DPI – 24,000, the highest on our list. The ability to adjust this as you play goes without saying. Also, just like the first mouse we reviewed, you have the option to adjust the weight. This allows you to find the perfect balance. The main issue is the software as it can be a bit buggy, and you have certain limitations with your macros. Furthermore, the side buttons don’t always have a crisp feel to them when pressed. It is also a pretty large mouse, but that isn’t a drawback – it just means you need to know what kind of a mouse fits your palm the best. MMOs attract a lot of players, so it’s only natural that there is specialized gaming gear for them. All three products we’ve reviewed can perform this job admirably, meaning you won’t go wrong regardless of which one you settle on. Still, we believe that the Logitech G600 is the best MMO gaming mouse. 2019 will give you plenty of opportunities to enjoy different MMOs, and the extensive customization options this mouse brings to the table will allow you to reign supreme (as long as you can use it to its full potential). But the other two mice also have their advantages so you shouldn’t hesitate if one of them appeals to you more.